Srinivas Rao is the host and founder of the popular podcast The Unmistakable Creative, where he’s interviewed more than 700 people from every walk of life imaginable. Today the show has over 500 5-star reviews in iTunes and reaches a global audience. 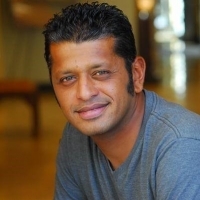 Srinivas is a Wall Street Journal bestselling author of 3 books: An Audience of One: Reclaiming Creativity for Its Own Sake, Unmistakable: Why Only is Better Than Best, and The Art of Being Unmistakable. His work has been featured in Forbes, Inc, Business Insider, and The New York Times. He writes and speaks about how organizations and individuals can increase their productivity and stand out in a sea of sameness by expressing their creativity. Budding entrepreneurs face down a variety of challenges as they work to transform an innovative idea into a real-world success. However, before they can worry about cash flow management or hiring quality employees, they need a product or service that stands out. • Rewrite industry best practices. Leave behind “rules” that no longer serve you and create ones that do. • Develop creative confidence. Overcome fear and doubt to execute new ideas. • Cultivate creative habits. Practice daily habits that promote innovative thinking and creative breakthroughs. Srinivas believes in finding out what’s truly unique about a company, individual, product or service. After all, if a business can identify something they offer that no other business does and effectively communicate that value to customers, then they can kiss competitors goodbye.